Humming along to Deep Purple’s “Smoke on the Water” being played through the ceiling speakers, I impatiently tap my toes on the filthy tile floor at bustling gas station while waiting in line. The middle aged woman in front of me peeps behind the plastic barrier next to the register, gawking at the box of electronic cigarettes on the other side as if she were on safari. The kid behind the register shrugs. Thus begun a 20 minute excursion down memory lane, which started with the simple intention of purchasing a Slurpee and ended with a detailed explanation of the dynamics behind electronic cigarettes. Luckily, this was only a day after my package of South Beach e-smokes had arrived, so I was freshly versed on the subject. For those who have yet to try this invention and all of the other confused middle aged women out there, electronic cigarettes work by vaporizing a liquid nicotine concoction. While not dissimilar to how other smokable plants are vaporized, the disposable cartridges are attached to the shaft of the cigarette containing the tiny but powerful battery. 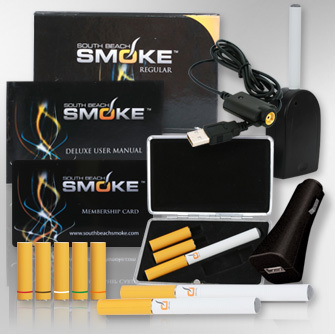 There is no igniter or flame used, the e-cigs produce virtually no heat, and the cartridges contain no tobacco, tar, or other additives found in traditional cigarettes. The South Beach e-smokes are rechargeable and offer 6 mg nicotine cartridges in classic tobacco, tobacco blue, tobacco gold, menthol, vanilla, chocolate, pina colada, cherry, peppermint, and peach flavors. Needless to say, there is something for everyone. A full cartridge is roughly equivalent to 2 packs of traditional cigarettes, although some distributors sell empty cartridges for smokers to fill with their own carcinogenic concoctions. This is what several UVSF writers had to say about the South Beach e-cig experience. The South Beach brand e-cigs claim to offer smooth flavor, maximum vapor, and the most advanced e-cig battery on the market, so naturally it seemed like a good starting point to lose my e-cig virginity. Having never tried an electronic cigarette before, I was uncertain of what to expect. The cigarettes themselves are an ingenious device for such novel technology. The fact that they are rechargeable is a financial godsend for smokers, however, I would love to see an environmentally friendly version of both the reusable and disposable e-cigs. My only beef with this product is that, on a few occasions, drawing too hard from the device will eject a small amount of the liquid nicotine into my mouth. While a fully unwholesome experience, it may have been the result of a faulty cartridge or the charge of the battery. There is no doubt that smoking these things takes a little getting used to, but they are so easy to use and super convenient. Starting with my favorite flavor, vanilla, I was pleasantly surprised by not just the sweetness of this cartridge, but the lack of any aftertaste or lingering smoke stench. The vapor will not stink up your clothes, hair, or car. Vanilla is such a light flavor that it not only opens up a huge dating pool of non-smokers for me, but now when I make out with strangers they compliment me on my breath. The scary part? I can literally puff on these all day long and not realize I’m taking in nicotine. It’s more akin to hashish tobacco found in hookahs than anything else. There are also no “cravings” throughout the day and no dizziness I occasionally get with stronger cigarettes. Throughout my entire smoking career, and I do make a career out of it, I’ve purchased menthol cigarettes four times – all of which were because it was the only pack I could afford at the time. The South Beach menthol is not particularly bad at all, and in fact I would much prefer a menthol e-cig to menthol tobacco. It lends a lingering taste of menthol mint without the ashy aftertaste in tobacco cigarettes – it’s akin to puffing on a stick of gum all day long. The classic tobacco is smooth and flavorful, albeit being a long way off from the real deal. For those seeking nothing more than cigarette replacement, South Beach offers three varieties of the tobacco flavor you might enjoy. In the end, there is no real replacement for a cigarette. The sad truth is that all of the terrible carcinogenic additives are exactly what make traditional cigarettes appealing – and when I say appealing, what I really mean is lethally addicting. While in no way healthy for you, these are undoubtedly a better alternative to tobacco cigs. Also, there is something positively gratifying about smoking a cigarette while pumping gas. The chocolate tastes a lot like chocolate cake; very authentic, very delicious. The vanilla is just as good, albeit on the other spectrum of taste. Sweet and tasty, but not overly so. The classic tobacco does a fine job in recreating a classic, unbeatable flavor, as does the menthol. With the exception of the hard burn associated with the carcinogenic chemicals found in normal cigarettes, these flavors are very authentic. As far as the actual smoking device – it’s quite a bit heavier than a real cig. I could imagine someone actually chipping their tooth on it. What I don’t like is that it tries way too hard to be an actual cigarette when it’s not. The white shaft containing the battery and orange, filter colored flavor cartridges could be a little more discrete. Overall, I very much look forward to adding the South Beach E-cig to my daily routine, alongside my Paul Mauls and marijuana. It would be interesting to see these come out in a variety of other flavors, and I believe we are only now seeing the tip of the iceberg for the future of electronic cigarettes. I smoked more grandpa smokes in anticipation of my electro’s debut. possible life saving (on a 747) new smoking device. will notice is a touch of butter, then a pleasing waif of vanilla. not replace that all important first smoke of the day.